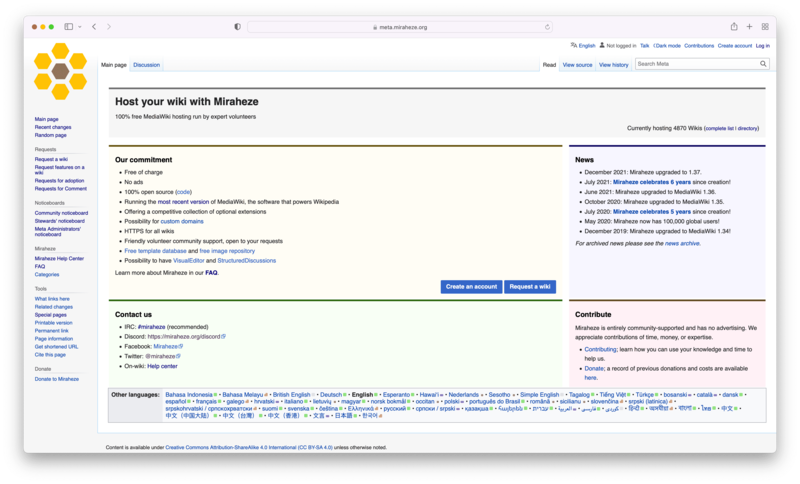 Miraheze is a non profit, with a mission to provide a free community-centric wiki farm. We use MediaWiki to run our wiki farm! You can do anything from uploading media such as images or videos, to writing articles or blogs. We have over 200 extensions and over 15 skins to choose from to customise your experience with MediaWiki! We have designed some of the most cutting edge extensions to help us grow and become one of the world's best wiki farm! Our extensions go from creating wikis to manging wikis from a special page. As a community we all work together to achieve a common goal of being a great wiki farm! This allows us to achieve the best possible outcome for users, by allowing users to learn! Our site is mobile optimised, so that all users are equal regardless of which device they use! Which Wiki software do you run? 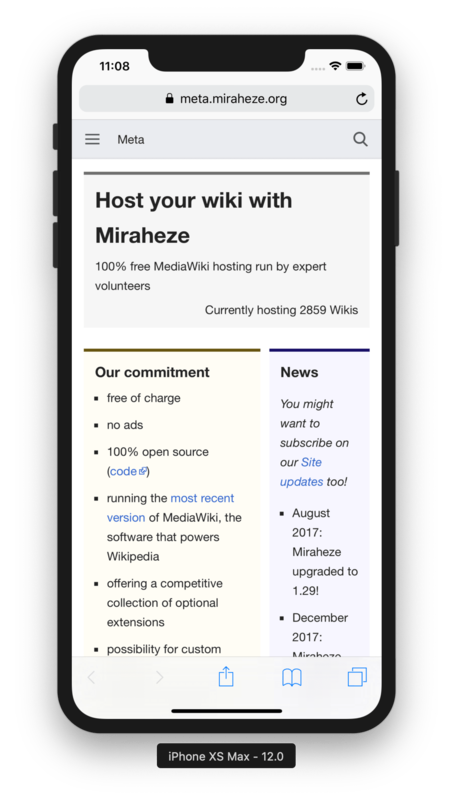 We run MediaWiki, the same software that powers Wikipedia. Yes we are, we recently disabled TLS 1.0 and TLS 1.1 in favour of being TLS 1.2+, you can read this blog post here. We rely on donations to maintain the servers, please see our finances at Finance! Where can I report bugs/feature requests? We use software called Phabricator located at phabricator.miraheze.org to track bug reports or feature suggestions. We started in 2015 as a transparent non-profit wiki farm. Since then we have grown. We are transparent with our finance or financial information which you can view here! Donating to Miraheze has its benefits! You will be supporting our mission to provide a free community-centric wiki farm, that is secure and free of ads giving you peace of mind! We will use this funding to keep existing servers operational, and we will also buy some new servers to expand due to our growing user/wiki base. Note that these are in US dollars, you will be able to convert it to your currency once on PayPal site. Except where otherwise noted, the content of this site is licensed under a Attribution-ShareAlike 4.0 International (CC BY-SA 4.0).